MISS IRAQ 2015, Shaymaa Qasim, begins her year of activities with Ministry of Culture, Tourism & Antiquities of Iraq. The Minister of Culture, Tourism and Antiquities of the Republic of Iraq, Fryad Rwandzi, officially welcomed the winner of Miss Iraq 2015, Shaymaa Qasim, in his office in Baghdad on Sunday, the 17th of January. 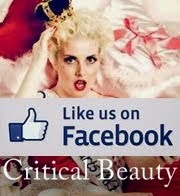 Minister Rwandzi insisted that beauty is not just that of the face and body but is also reflected in humanist actions. He stated that Miss Iraq will be assigned activities in the Ministry to help promote their projects. The Ministry also expressed its commitment to fully support Iraq's participation in Miss World and Miss Universe pageants. 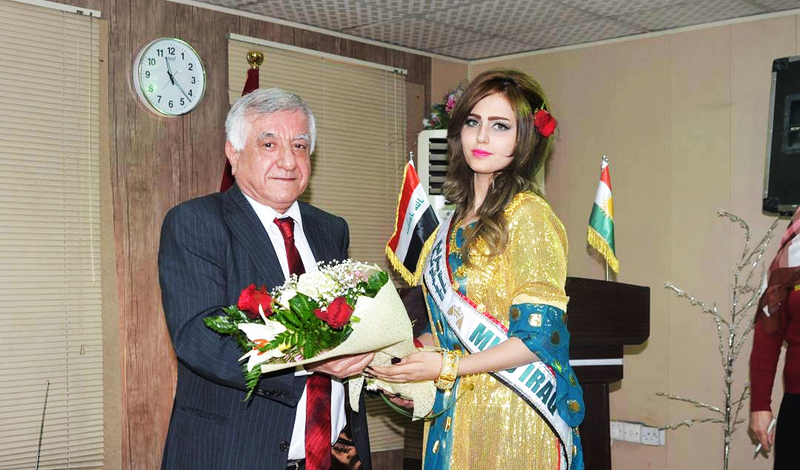 The honourable Minister commended the audacity of Miss Iraq and the organizers for holding the event in such difficult circumstances despite numerous threats by extremist elements, noting that such events are much needed to spread a culture of peace in order to reflect a new image of Iraq from what has been shattered by years of war and terrorism of ISIS and Al-Qaeda. At the conclusion of the meeting, Miss Iraq Shaymaa Qasim expressed her happiness and was pleased with this meeting and the support she has received from the Ministry of Culture, Tourism and Antiquities of Iraq. 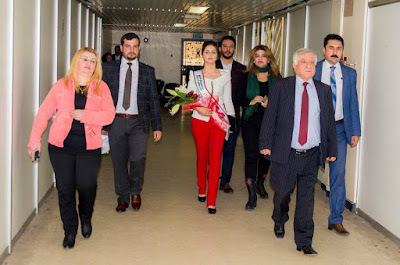 Earlier this month, the new Miss Iraq was hosted by the Iraqi House of Culture and Kurdish Publication at the Ministry where she participated in a press conference and toured the new Kurdish section at the Iraqi House of Fashion. 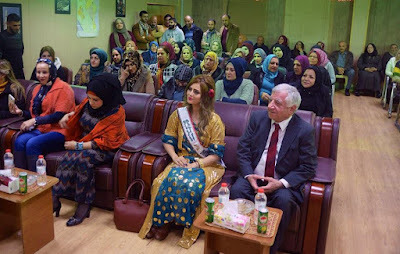 The first assignment by the Ministry of Culture, Tourism and Antiquities to Miss Iraq was with the Department of Cultural Relations. Shaymaa accompanied Mr. Falah Al-Ani, director general of Cultural Relations at the Ministry, for a visit to the southern governorate of Maysan where she spent a day with the children at the Abdul Ali Boys School in the city of Amarah and presented a prize for an international children's drawing contest to one of the students on behalf of the UNICEF. 20 year old Kurdish beauty from Kirkuk, Shaymaa Qasim Abdulrahman, was crowned MISS IRAQ 2015 at the Sheraton Grand Ishtar Hotel in Baghdad on 19th December 2015. 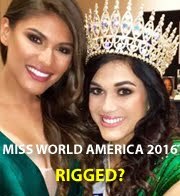 The national beauty pageant was televised for the first time ever in Iraq on Al-Mada TV with a delayed broadcast on 24th December. 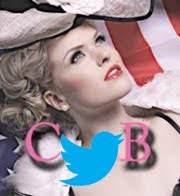 The event marked the return of Iraq's national beauty pageant for the first time since 1972. 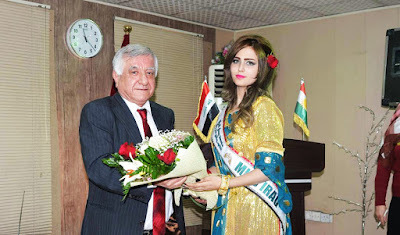 Miss Iraq is the only official national beauty pageant of Iraq recognized by the Government of Iraq through Ministry of Culture, Tourism & Antiquities and registered at the National Center of Copyrights & Protected Rights under the Ministry (registration No. 301/TH).